Subnetting is the process of dividing a Class A, B or C network into subnets, as we've seen in the preceding topics. In order to better understand how this division of the whole is accomplished, it's worth starting with a look at how the whole class A, B and C networks are represented in a subnetted environment. This is also of value because there are situations where you may need to define an unsubnetted network using subnetting notation. This might seem like a strange conceptif you aren't going to bother creating subnets, why do you need to consider how the old-fashioned classes are used under subnetting? The answer is that after subnetting became popular, most operating systems and networking hardware and software were designed under the assumption that subnetting would be used. Even if you decide not to subnet, you may need to express your unsubnetted network using a subnet mask. In essence, a non-subnetted class A, B or C network can be considered the default case of the more general, custom-subnetted network. Specifically, it is the case where we choose to divide the host ID so that zero bits are used for the subnet ID and all the bits are used for the host ID. I realize that this seems like a bit of a semantic game. However, this default case is the basis for the more practical subnetting we will examine in the next topic. Just as is always the case, the subnet mask for a default, unsubnetted class A, B or C network has ones for each bit that is used for network ID or subnet ID, and zeroes for the host ID bits. Of course, we just said we aren't subnetting, so there are no subnet ID bits! Thus, the subnet mask for this default case has 1s for the network ID portion and 0s for the host ID portion. This is called the default subnet mask for each of the IP address classes. Since classes A, B and C divide the network ID from the host ID on octet boundaries, the subnet mask will always have all ones or all zeroes in an octet. Therefore, the default subnet masks will always have 255s or 0s when expressed in decimal notation. 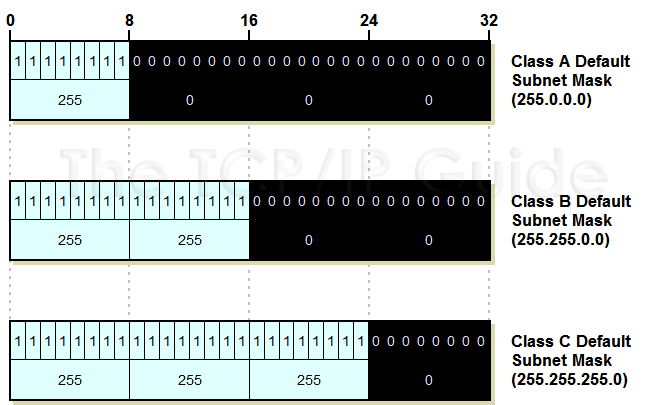 Table 51 summarizes the default subnet masks for each of the classes; they are also shown graphically in Figure 68. 255.255.0.0:,This is the default mask for Class B, but can also be the custom subnet mask for dividing a Class A network using 8 bits for the subnet ID (leaving 16 bits for the host ID). 255.255.255.0: This is the default subnet mask for Class C, but can be a custom Class A with 16 bits for the subnet ID or a Class B with 8 bits for the subnet ID. Key Concept: Each of the three IP unicast/broadcast address classes, A, B and C, has a default subnet mask defined that has a one for each bit of the classs network ID, a zero bit for each bit of its host ID, and no subnet ID bits. The three default subnet masks are 255.0.0.0 for Class A, 255.255.0.0 for class B, and 255.255.255.0 for Class C.